The following scenario frequently happens in our line of work, especially when we engage in conversations about Branding. At least for a while, the conversation is congenial and lively around the boardroom table. Part of the process of Branding includes several exercises designed to unearth the gold in the various activities of the company, and to find the work that is most important. We discuss all things demographic, psychographic, and geographic. We group their customers together and find the main problems and needs of each group. Then we work hard on the Golden Triangle–that sweet spot where: a) the company’s gifts are best suited to solve, b) the specific problem of the customer, c) and solve them in a way not easily duplicated by the competitor. Easy? Not on your life. Our goal through these exercises is to compile information that will yield an identity design that will serve the company and express its vision and mission for years to come. But with the exercises completed, the moment of truth arrives. They have to choose. Choose what? They have to choose the ideal customer–that group that will become the focus of all marketing efforts. This is where Branding can get scary. Even harrowing. It can get so frightening that seasoned executives can become angry with one another. Disagreements will erupt where they have never experienced disagreements before. It happens and it is good. It is good because it clarifies. The discussions are all a part of the process of Branding. Branding is deciding, and deciding is scary. What was once Brand is now Bland. They choose not to choose. It is the fear of Branding that threatens the very existence of your business. 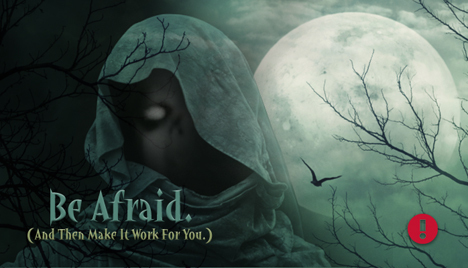 This fear is more perilous to the life of your business than any external pressure. 1. Not deciding is to decide. In not clarifying your target market, you have decided to water down your message. You have weakened your marketing magnet. In trying to reach everyone? Your message will reach no one. Your magnet will be spread so thin it will lose its strength, and will not be able to pick up anything of real weight. You will never hold the big customer and will be resigned to the little ones. Narrowing your focus makes your magnet stronger and more focused. Your messages will sound like personal conversations, instead of the ever-present blah blah blah marketing message. 2. No one ever created a strong brand by trying to appeal to everyone. No one wants a product that is designed for everyone. When was the last time you bought a one-size-fits-all T-shirt? It seems so counter-intuitive to make your customer base smaller instead of larger. But realistically, your product cannot help everyone–even if you sell milk. Knowing your customer–your specific customer–is the only way to find them, connect with them, and help them. 3. By watering down your message, you will never be top of mind. Let’s imagine you are choosing medicine for that bad headache that feels like you just fell out of bed on your right eye. You pick up a bottle from Company A. It reads ‘cold medicine’, and you quickly put it back to search for another choice. You wonder what else is available. You pick up the bottle from Company B. The label states very specifically that it “works quickly to relieve pain that feels like you just fell out of bed on your right eye.” We do not even have to imagine what you would do. And if the product proves to cure that stabbing pain behind your right eye, you will gain confidence in this particular brand. They will be top of mind when you have other ailments. Every brand wants to be top of mind. Remember, if you are astounding at one thing, people will assume you are astounding at other things as well. All you need to do is focus on astounding them all the time. The main reason for small business demise is failure to Brand. Calm your fears, and choose your target market. Prepare your marketing strategies for that group. Sell more by appealing to fewer people.The more you understand your customer, the more you can connect, and the more your messages will resonate. Narrowing your focus expands your market because it improves your aim. Your marketing will take less effort, less money, and less time. It will be ten times more effective. Effective marketing and advertising will never be scary. Banish the monsters from your kingdom by improving your Brand. Did you enjoy this series? If so, will you let us know in the comments below? 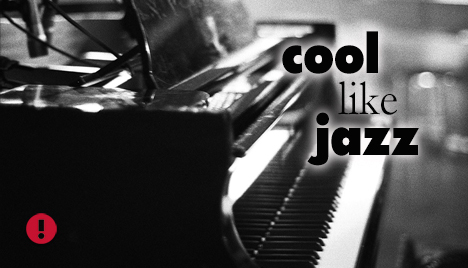 Is Your Business Strategy Cool Like Jazz? Entrepreneurs are a strange breed of people. All we need is for someone to tell us, “you can’t do that”, and that is challenge enough. With all the enthusiasm of an addicted gambler, we will head straight for the unpredictable, the uncertain, and the unlikely to happen. We thrive there. But as averse as we are to boredom, the odds are still stacked against us and looming larger every day. Disruptive technology and uncertain economies mean that entrepreneurs need the ability to morph and adapt to new environments quickly–just like a real transformer. Presto. Chango. We are something else now. Believe it or not, there is a certain breed of musicians who also thrive on this type of adrenaline: jazz musicians. Good jazz musicians and good entrepreneurs have much in common. That is exactly why jazz is a great model for small business strategy. Have you ever seen a jazz score? Take a look at the measures marked “solo”. Nothing there at all, you say? In the early days of jazz, performers had to share music scores quickly between gigs. They developed a method of music shorthand–a musical template, called a chart. The empty bars represented measures where the musician can play anything at all, as long as it fits within the structure. Small Business encounters many a situation where the answer is also not prescribed. But where the basic structure is defined, (melody, chord structure, rhythm and tempo), players can build on top, and make the most of any opportunity. Everyone gets a chance to solo and show their unique strengths. Jazz is more about what you do not play than what you do play. Jazz is lean, mean, and tight. The point is to play only the notes you need to play, and nothing more. Most jazz groups are small–quartets or quintets–and voicing is minimalistic. For that reason, the sound is quite different from other genres. Though the music may be highly advanced and technically difficult, it creates the most with the least. Savvy Entrepreneurs do the same. Jazz is highly adaptive to change. Jazz is serendipitous. Miles Davis said, “If it sounds clean and slick, I’ve been doing it too long.” Miles Davis wanted to play everything fresh and new as if he had never seen the score before. There were times when he would announce a key change of a jazz classic right before the performance so that the musicians would have to rethink the notes. Jazz musicians play and experiment at the same time. Jazz thrives on unpredictability, yet it is not a free-for-all. It is a requirement that jazz musicians listen closely to one another. Jazz is nothing without collaboration. Jazz is the musical equivalent of E Pluribus Unum, (Out of Many, One). Once the structural foundations are established, each musician can take risks in an encouraging environment, alternating between supporting and lead roles. Beauty is created upon a foundation of trust and a high degree of individual competency. Where the musicians get “in the zone”, they can transcend the music, and create something entirely new. Each time jazz musicians play a tune it can sound different from the previous performance. Not only is jazz change driven, but its very purpose is to change it together. No one could possibly get bored. The jazz model of small business is a synthesis between structure and flexibility, between control and autonomy. Good business leaders, like good band leaders, share the structure and get out of the way so that the musicians can build upon it. The very limitations of the group are disguised by the way the leader puts the group together. Leaders find musicians that will practice and hone their chops. This practice enables consistency- and prepares them for opportunity. The musicians trust one another and know each others technical abilities. And when it is their time to shine, they connect disparate parts to create something new and wonderful. And they create it together. Great entrepreneurs can create more innovation in the ranks using jazz as a strategy for business. Provide minimal structure to enable maximum collaboration and then get out of the way. When you do, you will create something cool, like jazz. Have you ever seen a Grant Wood painting? If so, you have seen Iowa. Iowa does look like that. You can argue with me, but I will contend no other State is as green. In case you did not know, we grow stuff here, and grow stuff very well at that. Since June is the month of unstoppable growth, we are going to talk all this month about growing businesses. That will add to the green! If only we could get our small businesses to grow like Iowa weeds in June! We once poured a cement slab over some weeds in our yard, only to have them grow out around that slab later in the summer. If only small businesses could be half that resilient! But with half of all start ups folding by year five, and half of the remainder folding by year ten, we know the Iowa weeds analogy could not be more incorrect. There are just too many ways to fail at small business. Let me count the ways. No, wait, I take that back. Let’s not. That would be too depressing. But there are certainly many common ways that entrepreneurs get the cart before the horse. So we are going to be discussing five of the most common ways that entrepreneurs are hitching their horses incorrectly. Since this is the new millennia, we will at least update the idiom. The vehicle of commerce is now a shopping cart. Either way, wooden or metal, horses still do not know what to do when the cart is in front. Case in point. I make a habit of listening to podcasts, mainly out of curiosity, to see what the “experts” in the marketing industry are teaching and to see what others deem essential marketing techniques for small business owners. I was listening this past week to one in particular, and was never more disappointed in my life. This shopping cart did not even have a horse–nothing to drive the cart at all. In fact it was loose in the parking lot. And it could cause damage out there. The entire webinar repeated the same mantra over and over: “Get the income you deserve! Don’t you deserve to get paid all that you are worth? Don’t you deserve to take that vacation? Of course you do! Click the button to sign up below to create the business of your dreams.” How I wish I could tell you there were more to the training than this. Oh, I almost forgot. There was a free PDF download. It was a “checklist” of marketing tasks–a reminder not to forget to mail out your postcards. Or to send your newsletter. And oh yes, it reminded you not to forget your email campaign. Every third month there was an extra task thrown in–sending out an extra postcard that was supposed to deliver a huge surge of cash flow every quarter, just like magic! Of course, no one would have ever thought of this checklist on their own. And of course, I’m being facetious. 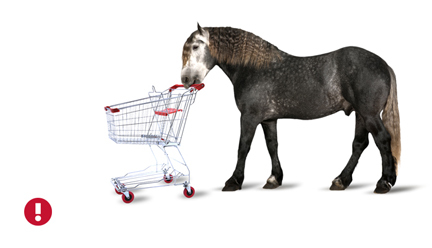 The shopping cart was indeed before the horse. Do you want to make more money in your business? We all do. Find a way to make your product more valuable.This will place your horse firmly in front of the cart. It will then be a much easier task to pull in the sales. It just makes good horse sense. 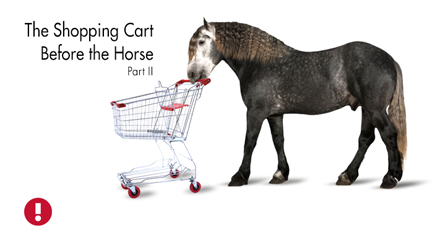 Stay tuned for Part II of The Shopping Cart Before the Horse, next week! 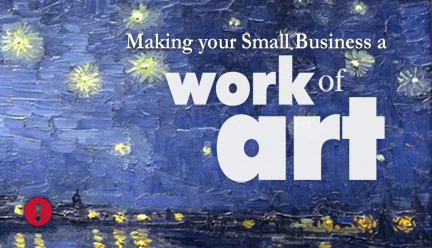 All this month we have been talking about the Artistic Business and Small Business as the highest art form. In Part I: We talked about how thinking like an artist will to help you to position your business in the marketplace. In Part II: We discussed how thinking like an artist will provide the best platform from which to compete. In Part III: We talked about how thinking like an artist will bring more creativity and more originality into your business. Why is it important to develop an Artistic Business mindset? Because if you think like an Artist and do your work as if creating a work of Art, you will create a successful business. The Artistic Business believes in their work. A true Art Master is fearless in the face of a blank canvas. They set to work with confidence. They know what they want to make, how they want to make it, and believe in the value of the final product before it has even begun. They see the finished image in their minds eye before they have laid the first brush stroke upon the canvas. The Artistic Business sees, and, therefore, can masterfully produce. Because they see the final product, they communicate masterfully. Because they are confident, they are fearless. The Artistic Business is honest. They are WYSIWYG. What you see is what you get. No matter how you slice it, the Artistic Business is the same on the inside as it is on the outside. They represent themselves and their product honestly. (The fake-it-till-you-make-it mantra does not apply.) They will not talk about their product as valuable until they are sure it is just that. The Artistic Business welcomes change. They understand that the pathway to success may follow a different route than originally planned. It may even be marked with detours. Openness to detours is a built-in part of the Artistic Business plan right from the start. These detours will not stop them in their tracks. They know that if they keep moving, they will see new opportunities open up. (You cannot steer a parked car.) They know that navigating the path to success will help them figure out what success means. The Artistic Businesses puts more back into the world than they take out. The Artistic Business wants to leave the world a better place than the way they found it. The Artistic Business helps support causes and works together with others in their communities to achieve common goals. These efforts are not a roundabout way to self-promote. The Artistic Business is honestly helping. They have figured out how to make a difference and sustain business at the very same time. The Artistic Business has an overarching Purpose. This Purpose presides over every other business activity and is larger than the business itself. This Purpose makes the world a more beautiful place. The Artistic Business has witnessed the effects of other businesses who value profits over purpose. They know the “profits first” mindset shoots the real meaning of profit in the foot. They know that making profit all about financial gain makes the world an ugly place. The Artistic Business does not do ugly. The world awaits your Masterpiece. The world needs you to share your gifts and skills in a way that makes it a more beautiful place. Want to gain more confidence as a business owner? 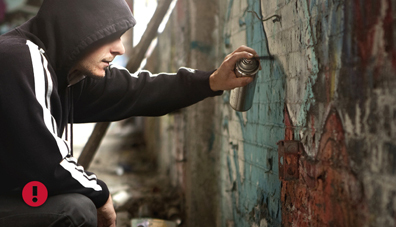 Employ the Artistic Business mindset in your business. Create something so good that you can stake your entire reputation upon it. Think this is easy?Not on your life. But only this kind of endeavor creates real Art. And nothing can give you more confidence in business than mastering your craft and creating real Art. You then, too, will become an Artistic Business. All this month we have been talking about small business as an art form and that of the highest level. Unless you have been hiding under your desk, you cannot help but notice the large amount of press being devoted to the value of creative intelligence in the workplace. Any person possessing large amounts of this ‘right stuff’ is suddenly the preferred candidate for top positions. Smart companies know that innovation seems to magically appear right behind any pixie who sprinkles this magic creative dust. Shortly after, old problems that everyone has been staring at for years also magically disappear. We all know certain people who have more than their fair share of creativity. It is almost as if God tripped with the carton open. For true Artists, creativity is akin to breathing. But whether you can draw a straight line or not, there is nothing to stop you from thinking more like an Artist. 1. Artists are compelled to create.They are like the little chick inside an egg– with a life force inside. If they do not break out and become all they are destined to be? They rot. Entrepreneurs who purposefully create space in their day for creative thinking will also awaken latent skills. Not feeling it? Take a brisk walk. Genius has proven the benefits of fresh air to force out the cobwebs and get the gears turning. (Check these articles out here and here.) Great things happen from the inside out. 2. Artists see differently. They thrive on perceived limitations. They often use the same raw materials that everyone else uses, but use them in a different way than was originally intended, and in doing so add tremendous value to those same materials. Artists make a habit of asking, “What else could we make with this?” Stop looking at limited resources as a problem. Creative Entrepreneurs ask the same question. 3. Artists choose their style. Then they work that style until they are very very good at it. No artist can afford to experiment with every medium. They only have so much room in their art kit anyway. They focus on the things that they do best. Creative Entrepreneurs also choose. They choose their style, their methods, and their offerings. By virtue of what they choose, they are also choosing to exclude something else. If you try to do it all, you will do nothing well. On the entrepreneurial journey, you can only fit so much in your sack anyway. Focus on what you do best, and excel. 4. 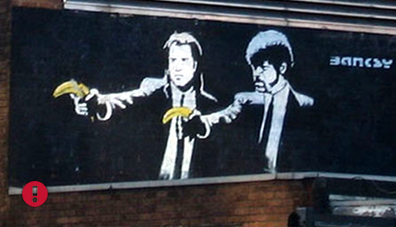 Artists are rebels. They do not do paint by number. They do their own thing. They do not waste time on things that do not matter in the deepest part of their hearts. They create from that place, and not to please the masses. Therefore, they are not quick to give up on their idea just because someone hates it. It goes without saying that real Entrepreneurs will do their homework to know if there is a market for their product before they begin business. But the presence of haters is not a sign of failure. In fact, haters may mean just the opposite. Every great product has haters. 5. Artists tell a million stories through their work. They know how you say it is as important as what you say. True artists know their message does not have to resonate with everyone–just a specific group. Because the message of their art is strong, that specific group is attracted as if by magic. Artists know the more powerfully they develop their message, the less they have to say. Imagine attending an art show where the Artist goes around telling people all about the features and benefits of their work. That would be–well–just so weird. Real Artists do not do that. You either do, or you do not like it. Artists do not try to convince anyone why they should love their work. Unfortunately, many small business people are not acting at all like real Artists. They are still trying to sell something to everyone. Focus on making your best art, and source it from your heart. Make it matter to your target audience, and you will attract them by default. Oh you little rebel you. Stay tuned for The Artistic Business–Part IV, next week! Artists and Entrepreneurs have very parallel problems. Real Artists and Entrepreneurs just want to work. And both want to sell their work. Is any Art real art without someone there to appreciate it? (I wax philosophical.) Whatever your definition of real art, it is certain that real art must be shared, or the whole world misses out. And eventually someone has to like it enough to buy it, or the Artist will not be able to continue to do what they desire to do. Let’s imagine the world of ideas as a circle. Let the center of the circle represent commodity ideas. If each idea is a dot, the center of the circle is filled with a high concentration of dots. It is almost black. It represents ideas that are easily copied, where supply is large, and value is low. As we move toward the outside of the circle, the dots become scarce. The outer edge is where innovation is found. Each dot now represents something highly original, highly valuable, and scarce. In this area, ideas that are so cutting-edge that they may not be understood by the general population at all, and the audience for such ideas is hard to find. Drawing a conclusion from this imaginary visual, (pun fully intended! ), is that the more your push your business to the outside of the circle, the more valuable your idea will be. The challenge for Artists and Entrepreneurs alike, is to find the balance: not so different it cannot be sold, and not so common it cannot be valued. One of the best strategies for entrepreneurs to add value to their offerings is by pushing their product toward the outside of the circle–making itan Original–with a capital O. Believe it or not, your best strategy for getting ahead of the competition is not lowering your price. It lies in creating better Art. Alas, it is also one of the most difficult things to accomplish. Perhaps you are in an industry that is so congested with competition you can barely get your big toe in the market. How can anyone dream up new ways of doing things that have not already been dreamed up? Take a trip to your local art museum. Each Artist uses the same raw materials that many other artists have used, and yet has created something that no one else has created, and transforms a few dollars of those same raw materials into something extremely valuable. No two paintings are alike, even if their subject matter is exactly the same. The best thing about the strategy of creating better Art is that you decide the style, what medium you wish to use, and just how far out you want to go. Another plus? Your competitors can become your friends because you are doing something completely different. Real creativity is born of constraint. There is no other kind. Think this is tough? Sure. Let the pressure of competition form you and bring out the Artist in you. Stay tuned for more articles in the series “The Artistic Business”, all this month.